In 2012, it was my daughters first birthday and friends and family wanted to know what to buy her. I thought long and hard about what she needed. To be honest, l couldn't justify them spending money on toys she was only going to play with for ten minutes before she got bored. Anyone with kids will know how expensive toys are. At the same time, I felt guilty telling people not to buy anything for her first birthday. I’m a creative person, so I started thinking of other ways to accept friends’ and family's offers of gifts. Then it hit me: why not ask everyone to spend the cost of the present they would have bought on ‘Random Acts of Kindness’? And my husband and I would do the same. I always loved the concept of paying it forward by doing random acts of kindness. This concept steers my soul in ways l can't explain. So, I started doing some research into the benefits of being kind. The more I researched the more I fell even more in love with this concept. I made up my mind that this was definitely the perfect gift as I would be paying it forward for a better future for her. What a better way to spend $40 investing in a kinder world through doing kind acts for strangers, instead of a toy. Did you know that when you perform an act of kindness, your body releases a 'feel good' hormone called oxytocin. Oxytocin is also known as the 'love hormone'. This hormone can do amazing things for you, it reduces stress, induces feelings of optimism, aids in sustainable weight loss, living longer, being happier, increases self-esteem and acts as an antidepressant, the list is long. Google it and see for yourself. My next thought was how can I get more people involved doing more acts of kindness? This is how 5 acts a day started. I want a better, happier future for everyone. I have pledged to make small contributions everyday to making this world even more awesome. I need you to join me on this amazing journey. Let’s combine our superpowers and be the change we what to see. You and I are super humans with superpowers, powers to make things that seem impossible, possible. Let's use our powers for the greater good of mankind. 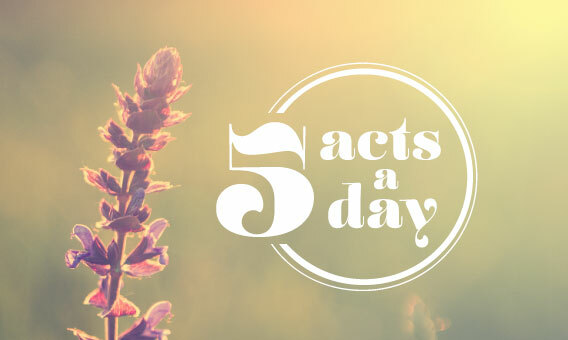 Sign up today and pledge to do 5 acts of kindness a day. I promise you that, once you start doing random acts of kindness you too will be hooked on the euphoric feeling you get and don't forget the amazing benefits of a longer, healthier, happier life. How awesome is this gift of giving that gives you back! Don't miss out on this life changing experience. Join today and start a chain reaction of kindness and compassion. Be the change you want to see.